Interested in contributing content to our blog? Contact us. The One Club's editors will consider it to be featured on the One Club's homepage. Already the largest show of its kind, the 15th Annual Paper Fashion Show was one of the event’s largest years yet. Over 950 guests and 100 volunteers attended The Hangar at Stanley Marketplace as 49 breathtakingly beautiful fashions, all designed entirely out of paper, took the stage. Shining light on Denver talent as well as designers from across the world, this all-volunteer organized and run event benefits our education and mentorship programs, scholarship funds and industry events, and has raised over $58,000 for the local non-profit, Downtown Aurora Visual Arts (DAVA). Dedicated to providing after-school arts programs for urban youth, several of DAVA’s students also designed fashions, modeled and helped judge the show itself. Kicking off with complimentary drinks, bites and booths full of fascinating, tactile samples from today’s top paper companies, the Paper Fashion Show was quickly up and off without a hitch. As the clock neared 7:45, everyone filed into the Hangar, the lights dimmed, and the crowd roared as DJ Simone and host, @yagirlcedes, introduced the first of 49 jaw-dropping fashions. Each of the 49 teams, 12 of which were student-lead, averaged 200~300 hours worth of work on their fashion. With the theme of flight, the event showcased everything from elaborate, 3D pop-up-book inspired dresses to fashions that would easily fit in on Rodeo Drive. 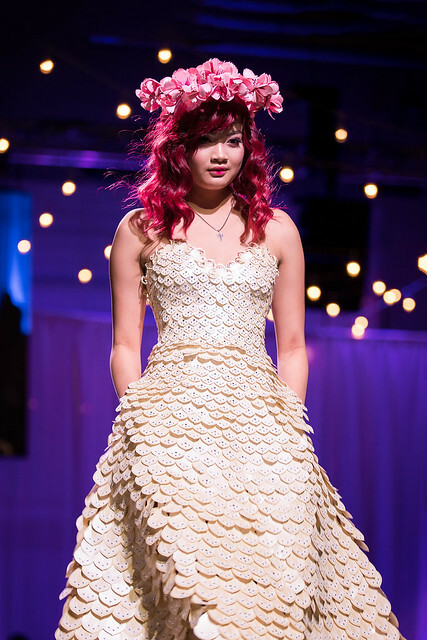 But it was the team Paper Couture who took the top spot with their dress and a $500 cash prize, “Sakura,” designed by Kim Lim along with hair styling from Leanne Marcolina. Featuring Aspire Petallics paper from CTI Paper USA and modeled by Cindy Wilson, the stunning white, wedding-dress-esque creation not only shimmered and flowed with thousands of white paper circles, but also came complete with pockets. Yes, pockets! We know. And second place was just as incredible. Blue Linen Creative’s “Flower of Life” was a mesmerizing mix of pink, orange, blue and black paper all folded origami-style into a flowing dress and a wing-like jacket that opened up as if it were a flower in full bloom. Featuring paper from Neenah Design Collection, the dress was designed and modeled by Jennifer Garber as well as Brielle Killip and Christopher Geissinger with hair styling from Candace Post. And finally, in third place came a stunning period piece from the team Rosa and Rivera. The bright blue, French-Rococo-inspired dress was titled “Rise of the Bluegeosie” and sported two winged sides with an intricately cut bird pattern and a large, white parasol for the perfect amount of 18th century French flair. Featuring paper from Neenah Textures and modeled by Adrienne Harness with hair from Molly Mitchell, the impeccable and impressive dress was designed by Emi Rosa and Rudy Rivera. The other three major awards for the night were DAVA’s Choice, the One Club Spirit Award, and the Star Student. DAVA’s Choice went to the one-and-only “Zephyrus – God of West Winds” designed by ArtHouse Design. From the moment model, Amber Dextrous took the stage, the crowd erupted with enthusiasm and applause, loving every second of the performance. The intricately cut bands of paper popped with every step, creating a pillowy, hypnotizing effect as the dress made its way down the runway. Featuring Construction from French Paper, the dress was designed by the team Marty Gregg, Beth Rosa, Zach Kotel, Anaïs Mares, Aaron Hilst, Abigail Knab, and Daisy Corso. The One Club Spirit Award then went to Veronica Dewey Design’s “Up in Flames” which featured an amazing bright orange and yellow, intricately cut cape that bent in ways you’d never imagine paper made possible. The super fun, firey fashion featured Mohawk Paper’s Carnival/Via, was modeled by Veronica Amancio with hair styling from Angie DeFrancis-Cox, and design by Veronica Dewey. Last but certainly not least was the Star Student Award, which went to the team Thrashed with their creation, “Arctic Extinction.” This wild, imaginative dress was bright white and blue like the ice of the Arctic, and incorporated origami animal heads representing species from around the world. Featuring Mohawk Paper’s Britehue, the fashion was modeled by Erica Duda with hair from McKlae Beamen and designed by students Erica Duda, Bailey Pixton, and Austin Draving. These star students were from Mesa Emerging Designers Club representing Colorado Mesa University. In addition to the individual awards, each award recipient received a specially curated prize package from show sponsors Love Pop Cards, a custom bag from She’s a Rainbow Colorado, and a hand drawn sketch of their fashion by Sparkle Priestess. Huge thanks to all the sponsors, volunteers, designers, hair and makeup teams, photographers, videographers, and every single person who attended. The show simply could not have happened without any of you. And we can’t wait to do it again next year! If you’d like a discount plus access to all sorts of other wild, fun and creative events, we encourage you to visit denver.oneclub.org/membership. We think you’ll be happy you did. On Friday February 8, the four final student teams, two from CU Boulder and two from RMCAD, stepped up to the podium to present their amazing ideas that tackled this year’s brief. Thanks to your support, The One Club For Creativity Denver has quickly become a major resource for the Rocky Mountain Creative Community. This past Monday, September 24, three of Colorado’s most beloved brands got together for our Denver Startup Week Speaker Series: Hometown Branding Heroes Done Good.